Goettingen, Germany, August 12, 2015 – To more effectively recover large molecular weight proteins, such as blood factors and conjugated proteins or viruses and virus-like particles, Sartorius Stedim Biotech (SSB) has reconfigured its Sartobind® membrane chromatography capsules. A range of capsule sizes with a 4 mm bed height is now available from the 1 mL nano unit up to the new 2.5 L jumbo version. The capsules’ upstream flow channels have been optimized, and an internal core forms a miniaturized downstream channel, resembling that in existing 8 mm bed height capsules. 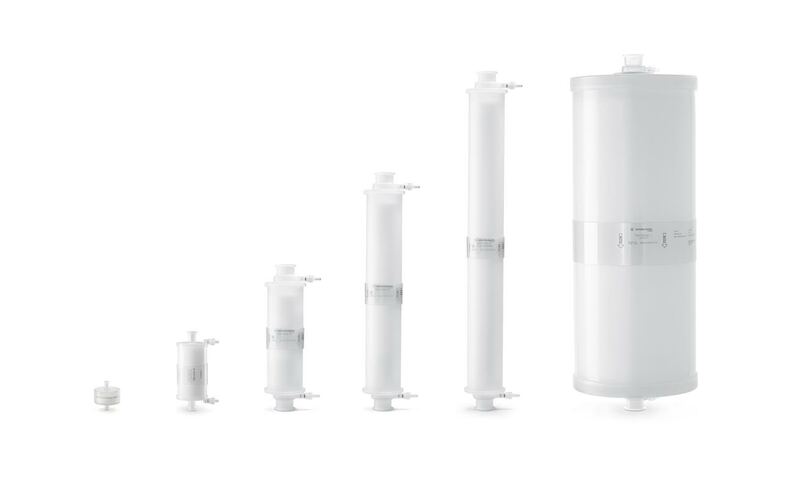 The new Q, S and salt-tolerant STIC PA ion exchanger capsules, all with a 4 mm bed height, increase dynamic binding capacity by approximately 15% and reduce void volumes by approximately 40% compared with their predecessors, while maintaining high flow rates of 10 to 30 membrane volumes per minute. By improving breakthrough behavior, subsequent polishing steps to remove DNA, HCP, aggregates and viruses from recombinant proteins are significantly more reliable and, as less buffer is used, Sartobind® also reduces operational costs. “Traditionally, membrane adsorbers have been using available filter housings, often ignoring chromatographic process parameters, such as back-mixing effects and elution volumes. This new generation of membrane adsorber capsules takes these specific requirements into account and reflects substantial progress for bind and elute applications,” commented Dr. Fischer-Frühholz, membrane chromatography expert at SSB. Furthermore, Sartorius Stedim Biotech has added new 400 mL and 800 mL Sartobind® Q, S and Phenyl capsules with an 8 mm bed height to its portfolio. These optimized capsules increase dynamic binding capacity up to 48% when compared to adsorbers installed in filter housings. Sartobind® membrane adsorbers: the new design of capsules enables higher binding capacities and reduced void volumes. Headquartered in Aubagne, France, Sartorius Stedim Biotech is listed on the Eurolist of Euronext Paris. With its own manufacturing and R&D sites in Europe, North America and Asia and a global network of sales companies, Sartorius Stedim Biotech enjoys a worldwide presence. Its key manufacturing and R&D site is in Germany. The company employs approx. 3,700 people, and in 2014 earned sales revenue of 683.5 million euros.